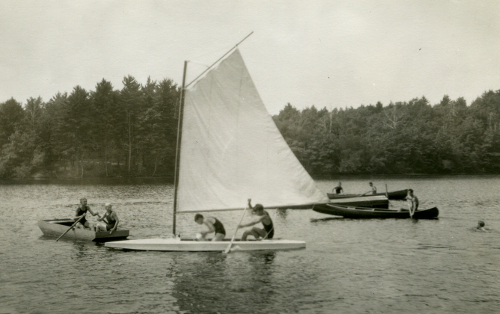 Photograph of Harris Barnes' boat and three rowboats on a lake at Camp Coolidge, a boy scout camp on Lake Neesoponsett in North Dana, Massachusetts. Harris and Prayne Barnes are in the boat. Barnes, Lincoln W., 1879-1966, “Harris Barnes' boat with three rowboats at Camp Coolidge,” Digital Amherst, accessed April 22, 2019, http://digitalamherst.org/items/show/1988.